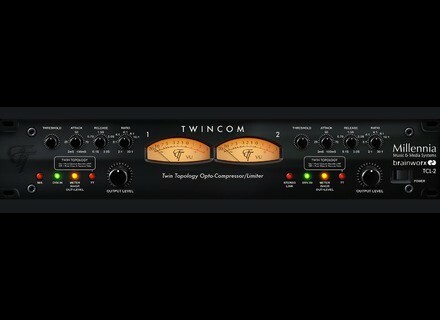 Millennia TCL-2, Software multiband compressor from Brainworx. Last plug-ins introduces by Plugin Alliance at Musikmesse, the Millennia TwinCom compressor and NSEQ-2 EQ modeled by Brainworx. Universal Audio UAD-2 and Apollo interface users already know the Millennia NSEQ-2 plug-in, for it was launched on this platform back in 2013 (see this news). The plug-in is now available in VST 2/3, AU, AAX DSP and Native, AudioSuite and RTAS formats for all DAWs on Mac OS X and Windows. The stereo parametric EQ plug-in reproduces the Class A Twin Topology, Brainworx even modeled the full 300V tube and discret JFET solid-state signal paths as well as the non linear behaviour of the hardware. The plug-in features 4 frequency bands between 20 Hz and 20 kHz with Q from 0.4 to 4. The Brainworx model includes new features, including a Mid/Side mode for mastering purposes as well as a Link mode for true stereo operation and an output gain. The Millennia NSEQ-2 plug-in is available for $299 at plugin-alliance.com, a trial version can also be downloaded. Last, Plugin Alliance launches another Millennia model by Brainworx, namely the TCL-2 that reproduces the TwinCom stereo opto-compressor/limiter, also equipped with a dual tube and JFET topology, with a few additions by the developer. The Brainworx Millennia TCL-2 is a VST 2/3, AU, RTAS, AAX DSP and Native and AudioSuite plug-in for Mac OS X and Windows. It has a price of $299 and a trial version can be downloaded from plugin-alliance.com. [Musikmesse] The Maag Audio EQ2 is now a plug-in Plugin Alliance will also unveil at Musikmesse the plug-in version of its EQ2, with the famous Air Band, developed by Maag Audio. [Musikmesse] Brainworx Vertigo VSM-3 Plugin Alliance will be at Musikmesse tomorrow to introduce four new plug-ins, including the Vertigo VSM-3 developed by Brainworx. [Musikmesse] Avid announces Sibelius 8 Avid is about to update its Sibelius music notation software to version 8, a version that you’ll have the opportunity to discover at Musikmesse.